This project took a little bit of patients and a lot of Mod Podge (probably because one of the cats spilt half the bottle on the rug). But I think the results were worth it (even the crunchy dry spot in the area rug now hidden under the ottoman). Because I'm so happy with how it turned out! These skulls are exactly what I pictured when I decided to do this project. 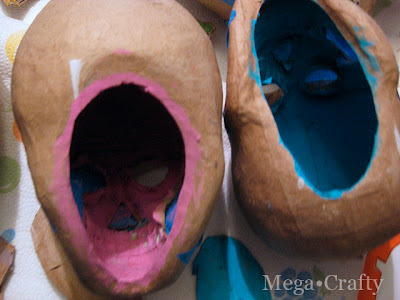 I started with paper mache skulls (which were super cheap at the craft store), some sheets of scrapbook paper (I used only a black, white and gray pallet), and some bright colored craft paint. The only problem was that the inside of the skulls wasn't finished. It was just bare newspaper and I didn't like that at all. But I couldn't finish the inside because the bottoms were sealed. So first I used a craft knife to cut hole into the bottom of each skull. Then covered the holes in the face with some low-tac tape, so the paint wouldn't run out. And painted the inside of each skull a different color. 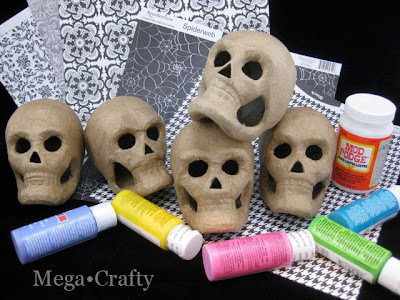 Once they were dry I decided which paper I wanted to go on each skull and started in with the Mod Podge. I'm not going to lie, this was some seriously meticulous decoupaging. Probably the hardest I've ever done because I really tried to make the patterned papers look seamless.To do that I cut the paper into small pieces and was careful to place them so that the edges matched as best as I could. Like a jigsaw puzzle. I also cut lots of little darts into the pieces of paper so they would lay smoothly over the curves in the top of the cranium and face. No doubt about it, I definitely worked my podging muscles. But they're stronger now than they were before, and I feel like I could do a big decoupaging project with no problem! After all the skulls were covered I used craft paint that matched the base color of the paper to fill in any bare spots showing through. 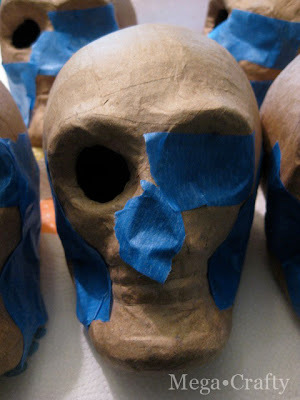 If I did this project again I'd definitely paint the entire skull before I covered it with paper. No matter how hard you try, tiny slivers of the skull underneath are going to show. Filling them in afterwards was harder than just giving the entire thing a base coat in the first place. If you're not into this much decoupaging you can also just partially cover them with paper, and draw in some details with a permanent marker. That's what I did with this guy, he's got some paper details on the top of his head and face, but most of the facial details were done with marker. I planned to display these on the dining room table but they creep The Mister out, so I might have to find a less conspicuous spot for them. These look awesome--but I can understand how they were really labor intensive! I am soon going to try your tip for felting/decorating acorns--ok if I show them (not the technique) on my blog as long as I link back to your page? Absolutely- I'd love it if you made then and posted about it. Please send me the link to your post when you do! And thanks for the comment on the skulls. They did take a while, but it was a great TV watching project (except for that whole mod podge on the carpet thing). These look great! I glittered two of these guys last year, but I love the mod podge idea. Super cute! I mean -- creepy! Who knows...you may want to mod podge the carpet someday! 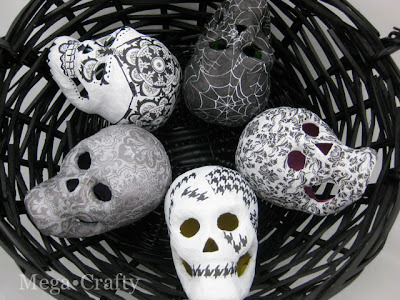 LOVE the skulls, especially the day of the dead one. Thanks for sharing. Thanks so much for the comments! And kluckingbear you're right maybe I will want to mod podge the carpet someday and this was a happy accident LOL! Awesome! So much cooler than you could purchase in a store! Love! I'd be thrilled if you'd link up to my Wickedly Creative Halloween Ideas Party. Wow! These are super cool! I can totally understand how they could take a while to do. The result is awesome!! Absolutely beautiful, Meg! I love how graphical the paper ends up looking on the skull shapes. Thanks, so much! A big reason why they were worth the meticulous podging was because I got to make something unique for myself rather than something picked up at a store... and at 2.99 for the skull and .59 cents for the paper they were pretty inexpensive to make. Ok, these are seriously wonderful. And, I didn't know I could buy papier-mâché skulls! Thanks for leaving a comment and becoming a new follower! Pinned this - your creativity is amazing Meg! These are so fun! I love them - each one is unique and cool in its own way! OK O brilliant one! How could you not have let me know you had made these? OMG! Genius! Fantastic! REALLY Spooky! I totally love them and if i were into skulls - which I am not - I would be right on this! 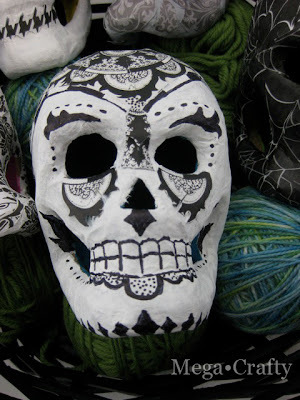 BUT I admit for the very first time ever i am tempted to make skulls! I popped onto your MegaSpooky site to see if there was something new to add to my Pinterest and there they were! LOL pam, LOL. 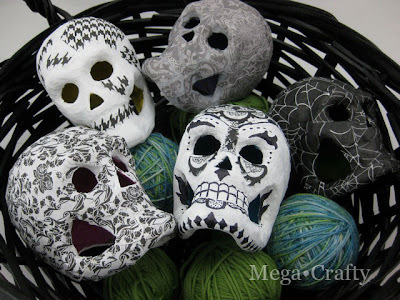 Tempting you over to the dark side of crafting with floral patterned skulls. Saw you on Modge Podge Rocks. 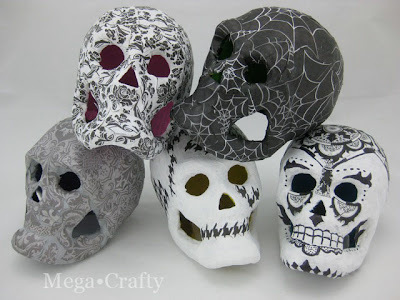 These skulls are amazing! Thanks for sharing! Hey! I featured this today! Check it out here. Grab a "featured" if you'd like. this is super awesome. Thanks for sharing!